If you’re a producer searching for a reliable event internet company to provide temporary internet access for your event, look no further than Made By WiFi. We specialize in providing Event WiFi solutions and short term internet connectivity for events of any scale from trade shows, conferences, fashion shows to outdoor events and festivals, we done it all. Our specialists possess the skills, equipment and industry insight required to build secure and fast wired and wireless internet networks for events nationwide, including New York City, Los Angeles, Miami, Washington DC, Chicago, Boston. With over 15 years of combined experience, our team has crafted custom solutions for hundreds of events in New York City. The years have taught us that an out-of-the-box event WiFi system can’t support a one-of-a-kind experience. That’s why we design temporary WiFi for events based on the specific needs of the event we’re supporting. Need to support 2 photo booths and 1 laptop? No problem. 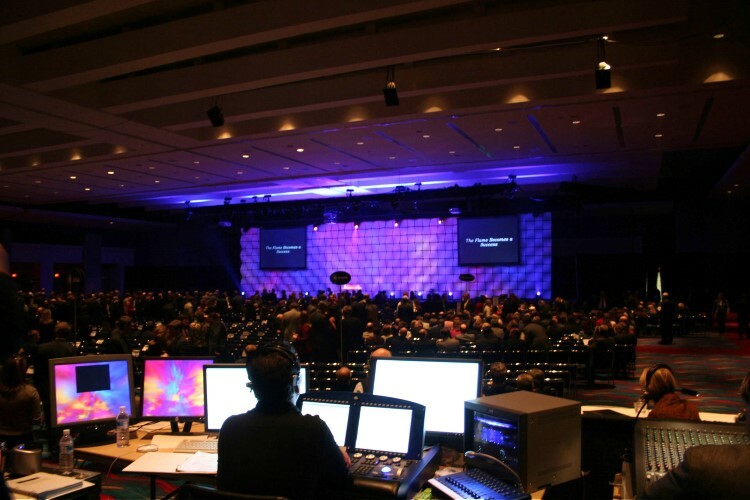 Looking for temporary internet connection and wireless access for 10,000 guests as well as wired connections for 20 members of your production team? Not an issue. Private connections for your vendors or presenters? Absolutely doable. You’re a Production Manager, Not a Network Engineer. Don’t waste your time learning network theory and studying to become a certified network technician. You’re already focusing on figuring out staging, lighting, electric and all the other moving parts that make up events and now you need to figure out how to provide a temporary internet connection. We’ve already done that work for you and we speak your language. Just tell us how soon you need the network up and we will get it done. We deploy temporary WiFi for events and short-term Internet connectivity for events every day and our processes are extremely efficient. We can complete an average wireless network installation in just a few hours and we know how to fix issues with wireless internet connectivity which may come up during the event. What Separates Us from other Event WiFi Providers? Everybody in our team knows the difference between regular WiFi and high density event WiFi. What Types Of Events Does Made By WiFi Support? Total devices – How many devices will require a WiFi connection? This isn’t limited to guests. Production staff, vendors and exhibitors will all have unique event WiFi needs. Coverage area – Think about the areas where coverage is essential and where the largest groups of people will congregate. These areas require special attention and coverage. Therefore, first determine whether your network will be limited to indoor, outdoor or hybrid coverage. Network usage – What will the event WiFi network be used for? Basic internet browsing and social media websites don’t have a huge demand on bandwidth and WiFi. Video streaming and other bandwidth intensive activities need to be planned for accordingly. Cellular coverage – Some event spaces are dead zones and have no 4G coverage. Even if an event space has coverage, cell towers can get overloaded if there are too many devices in a single area. In either situation, your event guests can get frustrated and leave. On-site support – There’s no room for error during an event. You should always plan to have a support technician on-site during your most mission critical times. Equipment type – It’s important that your event WiFi provider is not using cheap, dated equipment. We use current Ruckus Wireless 802.11ac Wave 2 access points and a variety of sophisticated gateway and network management tools to allow for full customization of your event WiFi network. Branding over WiFi – Your event WiFi network creates lot of opportunities to share your brand message with your guests. This includes custom network names, splash pages and advertising. We can develop a branded splash page for you that will allow you to communicate your message and collect email addresses for future marketing use. Temporary WiFi for events does not have to be difficult. Event planning is a tough job with many moving parts. It’s not fair to expect production managers, even the most seasoned ones, to become network engineers overnight. Our Event WiFi specialists have seen it all and have the industry knowledge and strategic partnerships in place to minimize your workload and maximize your results. Local ISPs – We know all the major short-term internet service providers in NYC and have relationships with ISPs in other primary and secondary markets nationwide. We will negotiate on your behalf and guarantee that you benefit from the highest quality Internet service for the lowest price. Local event venues – We have provided event WiFi services in all of New York’s major event venues. This means we have an intimate knowledge of every cable path, mounting location and general working space. Our knowledge means time and money saved for you as we don’t have to spend time surveying locations and figuring out how to get the job done. General experience – Our team has seen it all when it comes to event WiFi and we’ve learned how to deliver efficient, reliable event WiFi services that will make your event and save you money. Tiered network access – To put it simply, different types of users can have different network experiences. For example, guest WiFi users may have to log-in via splash page and could have a bandwidth limitation of 1mb to their device to prevent bandwidth hogging. Production staff WiFi users would not have to log-in via splash page and may have a higher or even no bandwidth limitation to their device. Again, this is just an example. Tiers can be adjusted for every unique event WiFi network. On-site & remote support – Events require immediate support if something goes wrong. We always schedules a technician to be on-site or monitoring remotely to guarantee immediate resolution in a worst case scenario. High density wireless equipment – We only uses equipment designed for high density deployments. Each access point we use is meant to support at least 100 connected device simultaneously while also offering throughput that exceeds hundred of megabits per device. Content filtering – We make sure that your event guests are using the network to share their experiences and expand your brand. We can proactively blocks users from accessing unwanted content like adult websites, pirated media or even your competitors’ websites. Per device VLANs – We offer per device VLANs for event WiFi guest networks. Per device VLANS means that every guest device gets put in its own isolated virtual network and devices will not be able to communicate with each other. This is a unique feature that adds layers of security to your event WiFi network. Reporting – We provide reports that highlight network usage throughout your event, individual user reports and real time utilization and geolocation reports. Network consultation – Wireless networking may seem intimidating, but it’s what we do everyday. Our wireless specialists can communicate directly with your vendors to determine their specific wireless needs and craft a network project plan on your behalf. Learn more about our wireless network consulting services. Custom splash pages – Our team promotes your brand by creating custom splash pages that will greet all users as they log onto your event WiFi network. With a 100% impression rate, splash pages are the perfect place to feature your brand message or serve as advertising space for your exhibitors or vendors. Splash pages can require users to disclose their e-mail address, phone number and other contact and demographic information. All of this authentication data can be exported and delivered to you for future marketing purposes. What Makes Our Temporary Event WiFi Solution So Unique? The WiFi network you set up for your event is not the same as the WiFi you set-up at your home. A $50 wireless access point may do the job in a 700 sq ft home with only a dozen connected devices but it just will not cut it in a 30,000 sq ft event space with thousands of devices simultaneously tweeting, posting pics to Instagram and streaming video. The temporary Internet connection that you set-up needs to be different as well. The Internet connection you have at home is what’s called a “best effort” connection. You may pay a monthly bill for a 100mb connection and, at times, you may receive a 100mb but the speed often fluctuates and your ISP is not contractually obligated to guarantee a minimum speed. Temporary event bandwidth is different. Critical items need extra attention and the bandwidth you use has to be guaranteed and dedicated. Devices streaming video typically require a minimum of 10mb upload speed dedicated to the device alone. Payment processing machines typically rely on 1mb of download speed. Due to that fact, this may not seem like much but think about the consequences if you are not able to process payments. Production staff typically need 1mb per device to do general work while on-site at the event space. Media members need some amount of dedicated bandwidth in order to do their job efficiently and spread your brand’s message to the masses. Made By WiFi is the event Internet provider you need to guarantee that your event’s video team, vendors, production staff, media guests and more have the bandwidth they need to do their jobs. When selecting a temporary internet service provider, we prefer to deliver symmetrical connections with a 99.999% SLA. Temporary WiFi For Events Done Right. Your event is our priority. Our team can help you be deploying a solid short-term WiFi network and Internet connection. Our group of talented wireless specialists work with your specific budget and needs in mind in order to craft the optimal solution for you. Don’t wait until the very last minute. Contact us today to connect with one of our wireless specialists and discuss your event needs.